GRANDVIEW, Mo. 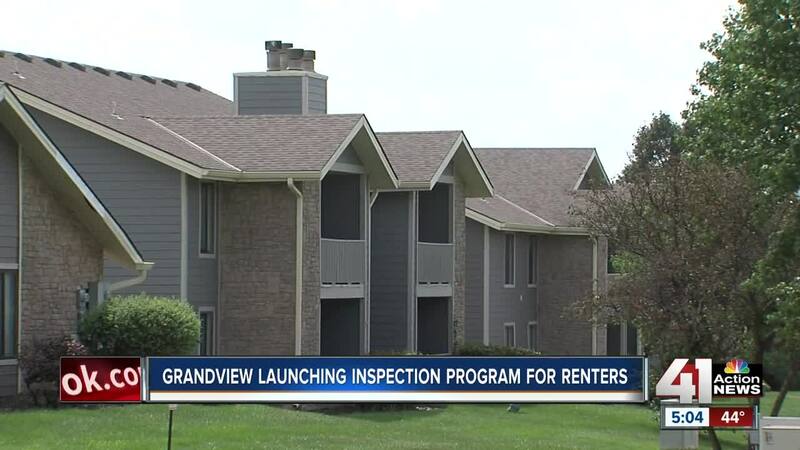 — Half of the people who live in Grandview are renters, and the city is hoping to launch a new inspection program to help them. "The main reason is to make sure that the rental units are safe and secure," Mayor Leonard Jones said. The program would allow an inspector to look at unoccupied units and determine whether or not they're up to code before tenants move in. Inspectors could also investigate renters' complaints. "We won't go into a unit unless the tenant asks us to," said Billie Hufford, who was hired by the city in May to research and launch the program. According to Hufford, the desire for inspections in Grandview dates back a decade, when aldermen passed a rental registration ordinance but did not have the funding to hire staff. If aldermen approve the measure later this month, Hufford will be busy. Right now she's the only inspector on staff, and there are more than 4,000 units in Grandview. Once the program is underway, the city can evaluate the need for more inspectors. While designing the program, Hufford spent a lot of time talking to landlords, many of whom have been critical of the inspections . They argue the measures burden compliant landlords while slumlords continue to ignore the rules. "Excessive bureaucratic regulations and fees, like landlords are now facing in Kansas City, MO, will have a negative impact on housing affordability by increasing the cost of providing housing, while the area is already in the midst of a housing affordability crisis," wrote Landlords, Inc. President Robert Long. Hufford explained they tried to take finances into account when they made the annual registration fee $12 per unit and the inspection $20. "We didn't want the landlords to think we were out to get them, punishing them, that we were doing this just for money," she said. In reality Grandview will lose money in the first year of the program with the hope of eventually breaking even. Voters in Kansas City, MO approved the Healthy Homes Rental Inspection Program in August. The annual permit fee per unit is $20, with a $150 re-inspection fee for the first unit and $100 for each one after. If a renter did not call in a complaint, inspectors can only enter occupied units in emergency situations or if the tenant has at least 5-days notice. Grandview Mayor Leonard Jones took notes from the Kansas City Health Department's program. "We've learned a lot from them, and hopefully we've revamped our program to make it even better," he said. Grandview will have a public hearing regarding the program at 7 p.m. on Jan. 8 at City Hall.